deal with a pet’s mess like expert carpet cleaners. Imagine your dog tracked in mud from outside. The first step is probably to get the dog’s paws cleaned up to lessen the amount of floor that will need to be cleaned. There are plenty of carpet cleaners on the market, but chances are you might not even need one of those. Often some hot water, clean towels, a bristle brush, and some mild detergent will do the trick. Get as much mud sopped up before adding any water. Next, make a paste with the water and powdered detergent. Apply this to the dirty areas with the bristle brush. Let this solution set for about fifteen minutes. Then the key is to not scrub, but dab. Scrubbing will spread the mess and grind it further into the carpet. Get the towels wet and wipe up the paste and hopefully, the mud. After all of this thoroughly dry the areas you cleaned with towels. A fan might be handy at this point. under the carpet. 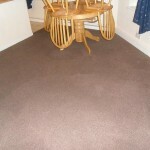 Researching for carpet cleaning tricks online will probably be a good plan in this area. Pets fit well into most homes. They can be trained to do tricks, obey commands, and avoid certain rooms. Even with all of that in place, you will probably have some extra cleaning to do occasionally due to a pet mishap. Luckily for you, there is a whole market of carpet cleaners available to help you get the job done and let you get back to the fun parts of pet ownership.